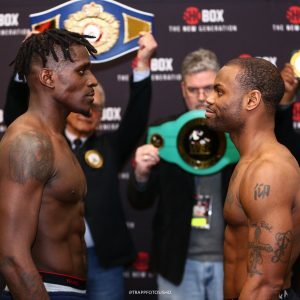 Super Middleweight Ronald “Akeem” Ellis lost a majority decision to DeAndre Ware for the vacant NABA, USBO and WBC Continental Americas Super Middleweight Titles. Vito Mielnicki’s GH3, Split-T Management and Greg Cohen Promotions promoted Friday night’s event over ShoBox at the Main Street Armory in Rochester, NY. In the Main Event Super Middleweight Ronald “Reckless” Ellis, 15-1-2 (10), of Lynn, MASS, lost a majority decision to DeAndre “Axeman” Ware, 13-1-2 (8), of Toledo, OH, over 10 rounds. In the first round Ware forced the action with Ellis looking over anxious not as busy. The shorter Ware seemed to use his jab better than Ellis. In the second round Ellis settled down more using his reach to an advantage. Ellis never backed up jabbing and using body punching. Ellis landed a long right to the chin just prior to the bell having a better round. In the third round Ellis landed a chopping right to the head. Into a minute of the round Ellis landed a combination to the head. Ware landed several jabs followed by a right to the chin. Ellis landed a counter right to the chin. Inside a minute left in the round Ware landed a solid right to the chin. Ware landed a double left hook to the body. In the fourth round Ellis used a good jab. Ware landed a solid right to the chin. Ellis landed several jabs followed by a right to the chin. Too many clinches in the round for referee Michael Griffin. Ellis had a better round using his jab. In the fifth round Ellis finally took the lead with Ware backing up for the first minute before Ware once again started moving forward. Ware walked into a right uppercut from Ellis. Ellis landed a solid right uppercut with half a minute left in the round. Ware with less of a reach seemed to land as many jabs. In the sixth round more movement than punches landed for the first half of the round with Ware chasing Ellis. Finally getting inside Ware landed a right uppercut. Ware walked into a right uppercut. In the seventh round both went toe to toe for half a minute at the start of the round. Halfway through the round Ware landed a good uppercut. With less than a minute left in the round Ware landed a flurry having Ellis against the ropes. Ellis kept moving working his jab. Ware finished strong landing a flurry at the bell. In the eighth round Ware came out throwing but Ellis matched him punch for punch. Halfway through the round Ware landed a flurry of punches to the head. Ware never stops coming forward. Ellis landed a combination. He kept using his jab but Wade landed several solid punches up to the bell. In the ninth round Ellis is using his jab moving backwards. Ellis came into this fight recovering from a right hand injury and has only been using it sparingly. Ware punched Ellis to the ropes but got countered well from Ellis. Inside Ware landed a chopping right to the head of Ellis who was leaning in. Ware drove Ellis into the ropes with body shots. In the tenth and final round with Ware pressing in Ellis landed a flurry of punches to the head. Inside Ellis landed a left hook to the chin. Ellis flurried to the body. Halfway through the round Ware and Ellis mixed it up inside. In the final minute Ware bullied his way in but was not throwing punches as Ellis had him walking into punches. Scores were 96-94 twice and 95-95 as did this writer have it. In the Co-Feature Lightweight Thomas “Gunna Man” Mattice, 13-1-1 (10), of Cleveland, OH, lost a mild upset to “Ill” Will Medera, 13-0-2 (6), of Albany, NY, over 8 rounds of action. In the first round Medera pushed the action with several body shots. After a minute of mostly jabs Mattice opened up with a combination. Halfway through the round Medera landed a lead right to tht chin of Mattice. Mattice came back seconds later with a right of his own to the chin. Mattice used a good steady jab while Medera threw more heavier punches. In the second round Mattice landed a good left hook to the head of Medera. Medera continued coming forward working the body. After a minute of action Medera landed a solid right to the head of Mattice. Mattice came back with a right uppercut to the chin of Medera. Medera missed with a right that was countered by a Mattice left hook on the chin. Medera landed a 3-punch combination ending with a right to the chin. Medera landed a solid left hook to the chin of Mattice just prior to the bell. In the third round both fighters landed rights to the chin of one another. Mattice landed a flurry of four punches. Mattice finally stayed in the middle of the ring landing a solid right to the chin. Then he started moving once again. Inside a minute left in the round Medera landed several good body shots. With less than half a minute to go referee Charley Fitch had to break up the first clinch. In the fifth round Medera kept coming forward working the body until he was countered by a right from Mattice on the chin. Mattice landed a lead right to the chin. Mattice landed a double left hook to the body and head. Medera landed a flurry of body punches but was countered with a left hook to the chin at the bell. In the sixth round Mattice landed a double left hook ending with a right to the chin. Mattice landed his best punch of the fight a right after a lead jab to the chin of Medera. Mattice landed half a dozen punches without return to the head of Medera. In the seventh round both fighters opened up with power punches with Medera still working the body while Mattice landed a good uppercut after a variety of jabs. Medera continued working the body with Mattice jabbing and landing counter rights. This was the closest round of the fight. In the eighth and final round Medera continued going mostly to the body while Mattice landed jab after jab. Neither fighter seemed to go all out in a very close fight being it was the final round. Mattice landed a flurry at the bell. Scores were 78-74 and 77-75 twice. This writer had it 76-76. Middleweight Dominic Wade, 19-1 (13), of Largo, MD, returned to action since losing a title fight to GGG scoring a knockout over Martin Fidel Rios, 23-19-4 (13), of Parea, LaPampa, ARG, at 1:48 of the first round. Ring announcer was Thomas Treiber.